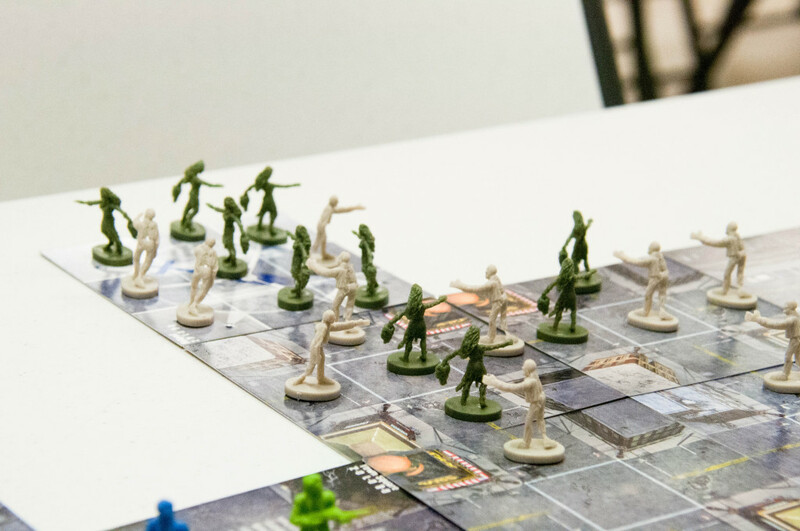 Tabletop University Play Report: Zombies!!! 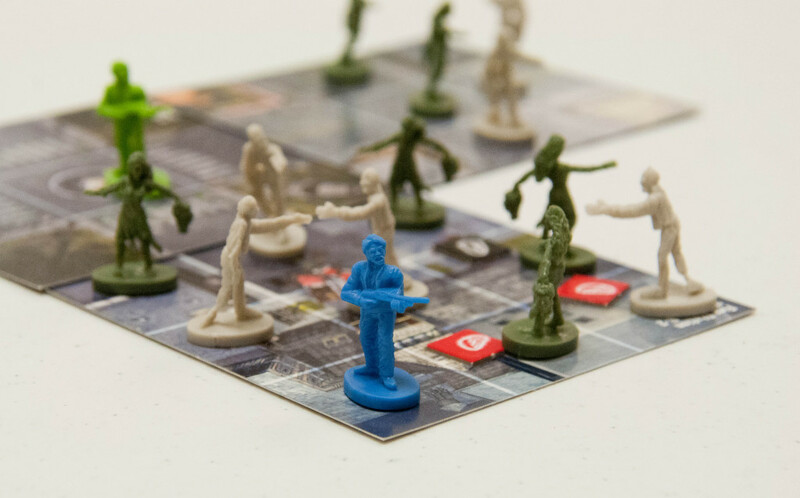 Tabletop University kicked off a monster-themed month of board games with a classic board game, Zombies!!! It’s a “human versus the reanimated, competitive, survival of the fittest, race for the helipad to escape” kind of scenario. And there are a TON of flesh eaters just waiting to be placed on the board…!!! Our group was super tiny this week, so we started out the evening chatting about the likelihood of surviving a zombie apocalypse. Tram, Will, and I have volunteered certain survival skills/instincts in the event that a virus does break out, kills us, and then reanimates us with a thirst for brains. Skills may include archery, bow making, and/or making soap in a crock pot. And, after watching Tram & Will play Zombies!! !, I’d be proud to have them on my survivalist team any day! Will mentioned that the State of Kansas has signed a proclamation (as of last month) to begin preparing for a zombie apocalypse. I, for one, believe that if the Pentagon is prepared for zombies, then we should be as well. But don’t panic quite yet, while the Governor of Kansas has signed this declaration, it’s really more of a fun way to learn about emergency preparedness than a serious tactical plan for fending off zombies. Let me start off by saying that this game is not a cooperative effort. It is NOT a cooperative effort!!! Next, let me say, that if and when you play against Will – BEWARE! He’s ruthless! 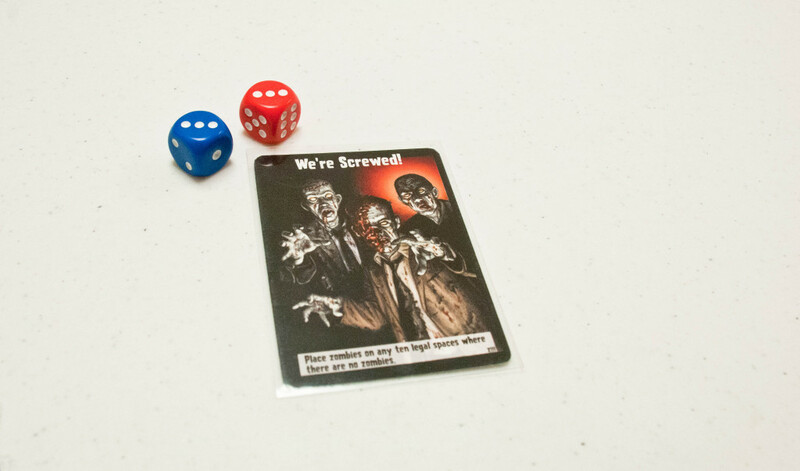 The photo above shows my character being surrounded by zombies after my very first turn because Will played an event card, on his very first turn, that allowed him to do this. The basis for this game is pretty simple. We all start on the same tile named Town Square. Each person receives 3 life tokens, 3 bullet tokens, and 3 cards from the event deck. Draw a new tile and attach it to the current landscape beginning with Town Square and continuing outward. All roads must match up and cannot be blocked by other tiles. Each tile will specify the number of zombies, number of life tokens, and the number of bullet tokens that must be placed on the card. Fight any zombies on your current space. Draw back up to 3 event cards. Roll 1 D6 for movement and move up to that number. Stop to fight zombies along the way. Roll 1 D6 to move a certain number of zombies one space each. Discard one event card if you so choose. We continue drawing and placing tiles to make our lovely town whilst fighting zombies, gathering tokens, and sabotaging each other with event cards. The current goal at this point is to stay alive and build up your artillery; each player is allowed to gather and hold onto a max of 5 life tokens, but as many bullets as he/she can hoard! 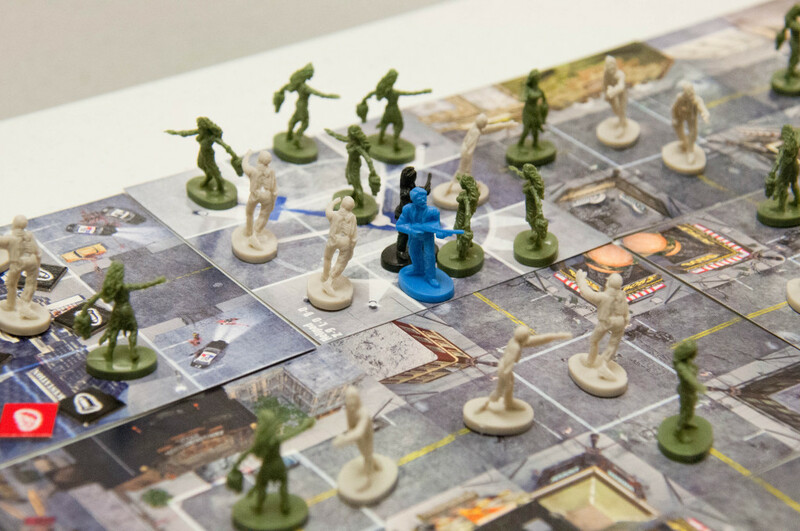 It’s also important to kill as many zombies as possible because one of the winning conditions is to accumulate 25 zombies before anyone else. 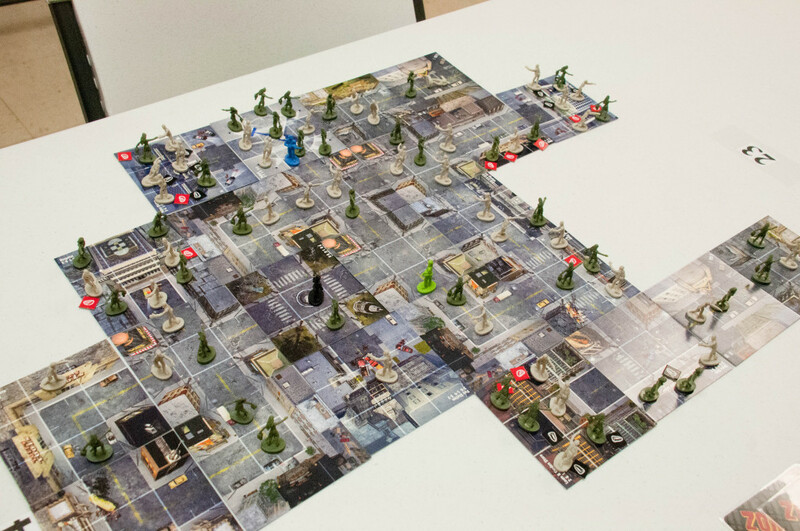 The other winning condition comes into play when the helipad is drawn from the tile deck. The person with the fewest number of zombies killed gets to attach the helipad to the town. 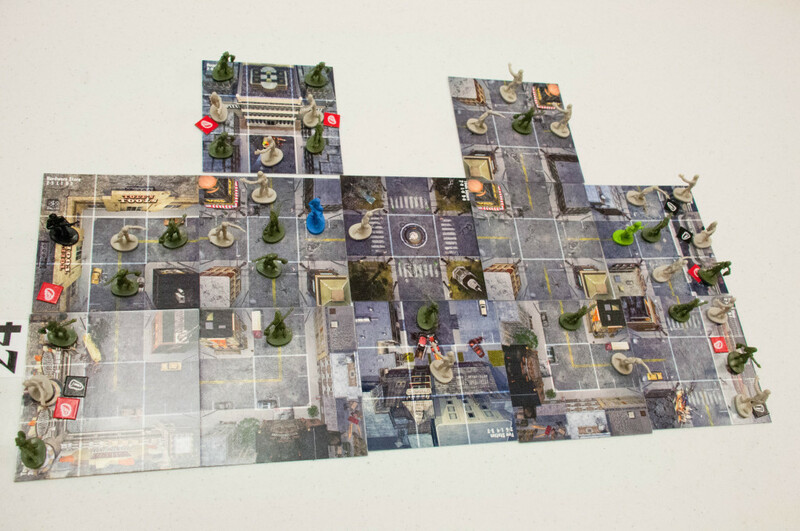 The first player to safely reach the helipad, fight their way to the center of it, and kill the zombie in the center (if there is one) flies away to safety and wins! Here, you can see that we’re all three spread out, doing our own thing. The town is growing, but still no helipad yet. Until the next turn, when dah-dah-dah-DAH, the helipad has surfaced and was illegally placed. 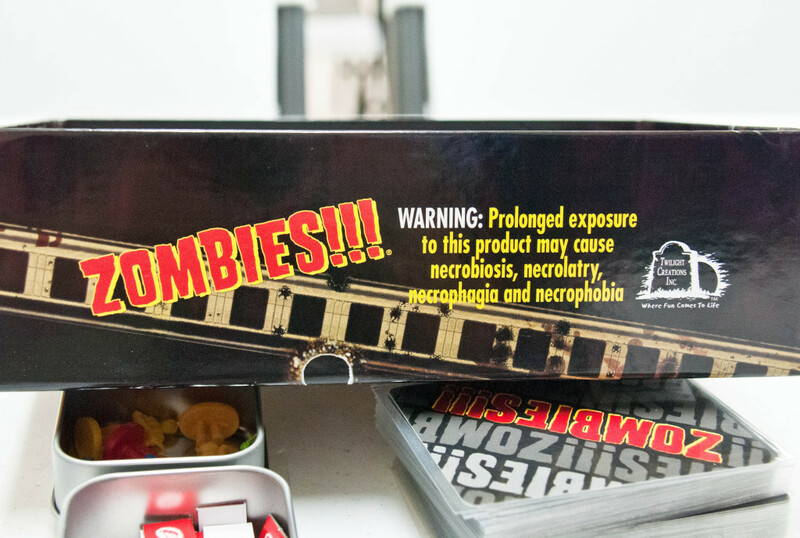 In all of the excitement, I placed it on the table, when in fact, I probably did not have the least number of zombies in my collection… We realized the error and quickly moved on because there was a swarm of mindless flesh eaters standing between us and escape. It was a race to the finish as Will and Tram died in the battlefield ending up back in Town Square. 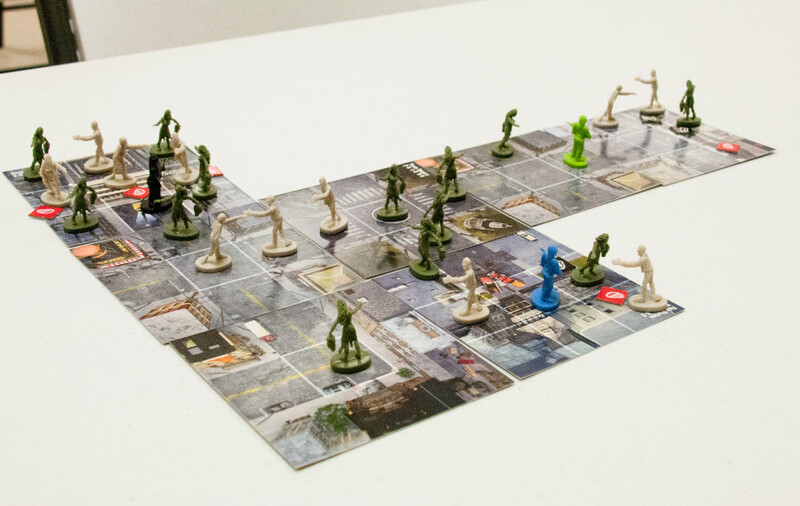 If a player dies in this game, he/she moves their pawn back to Town Square, discards any items/weapons/tokens in play for their character, gives up half of their accumulated zombie trophies (rounded up), and immediately ends their turn. He/she will start their next turn with 3 new life tokens and 3 new bullet tokens. The helipad was placed pretty close to the Town Square, so we were all three seriously neck and neck. I thought I had a victory in the bag… ONE space away from the center of the helipad. I played a card allowing me to clear the path, but as I started my movement to win, Tram played a card on me forcing me to move backwards instead. Along my path, away from the helipad, I encountered several zombies, which I fought vigorously until the very end. But alas, I died. Will moved in for the victory! Congrats to the event card playing, zombie-killing champion of the night! Lots of fun, lots of unexpected turns due to the event cards, and lots of expansions to explore! Zombies!!! is a great game that is simple enough in the rules and the mechanics but also challenging enough to keep the adrenaline pumping!